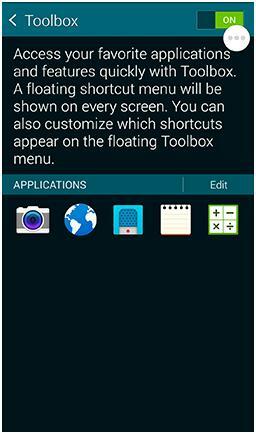 [Galaxy Alpha] What is Toolbox and how do I use it? 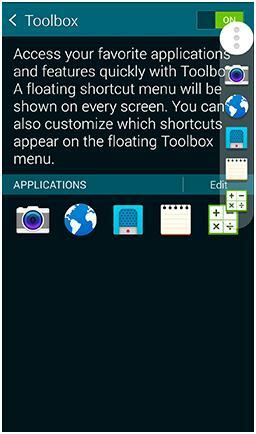 Toolbox lets you access your favourite applications and features through a floating shortcut menu. When turned on the menu is customisable and can display on every screen. To quickly turn Toolbox on or off use the shortcut in the Quick Panel. To access the Quick Panel swipe two fingers from the top of the screen downwards and then touch the Toolbox shortcut to turn Toolbox on or off. 1. To turn on Toolbox from the Home screen touch Apps > Settings > Toolbox . 2. Touch the switch to turn Toolbox on . You can move Toolbox to a different area of the screen by touching and holding on the icon, dragging it to the desired screen location and then releasing it. 3. To open Toolbox shortcuts touch from any screen. After Toolbox is turned on you can add and remove applications from Toolbox. From the Home screen touch Apps > Settings > Toolbox . 2. Touch Edit and select the applications from the available list. You can have a maximum of five applications. 3. Touch Save to apply your changes. Not what you were looking for? Let us help you directly! Chat Live online with an agent. Email us directly. We aim to respond within 24 hours. Visit your Country Site if you live and/or purchased your Samsung products outside Malaysia. All product and contact information on this page applies to Samsung customers and products purchased within Malaysia only. How Would You Improve This Answer? Help us improve our contents by submitting your comment below. We’ll try to implement your suggestion. NOTE: We cannot respond without your name and email address. 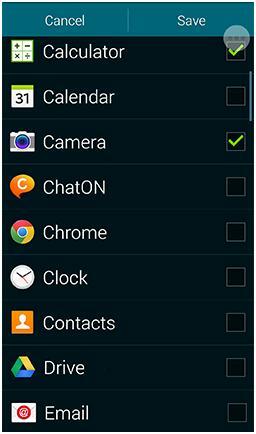 What do the notification light colours mean on my Samsung Galaxy Alpha? Search the nearest Samsung Service Centres in your area.